As a veteran Android developer, I have always been curious about the iOS platform. Is Objective-C hard to learn? Is it really much easier to make beautiful UI in iOS? The first three weeks were painful. Not only I did not know anything, but I lacked the vocabulary to ask questions. I would search for something and find 5 Stack Overflow threads, all of which sounding kind of related to what I need, but not really. It was really frustrating. It all makes sense after the fact, but when I first started I would drag and drag and drag and not be able to link the views. Sometimes I forgot to specify the view controller. Other times I forgot to add the IBOutlet. On late nights I forgot it’s right-click drag, not just drag. Once I got the ropes around UI editing, I can build the various screens for the app. People claim that the built-in components in iOS are much more beautiful than Android, but the gap has significantly narrowed since Ice Cream Sandwich. Sure, the iOS UIPickerView is still much more delightful to use than the Android Spinner, but the basic components like buttons are pretty much on par. There was one thing that was much much easier to use on iOS than Android: the camera preview. 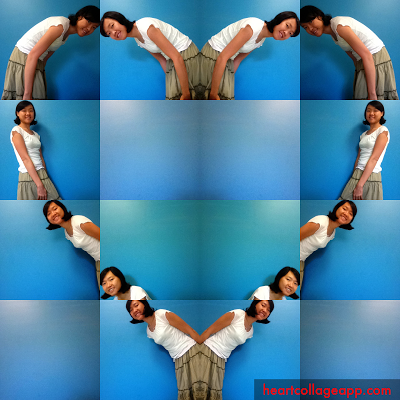 Heart Collage shows a square camera preview for you to pose. In iOS, I can ask for a preview window in any aspect ratio, and the system crops the camera feed automatically. In Android? The system stretches the camera feed to the aspect ratio of the preview. To make a square camera preview I had to make the preview window the same aspect ratio as the camera feed, and cover up some parts so it appears to be a square. It was really involved. Who wants a distorted camera feed anyway? Cropping is the right thing to do. For the rest I almost always find direct correspondences: ImageView maps to UIImageView, TextView maps to UILabel, ListView is roughly UITableView, and GridView... well GridView is interesting. Up until iOS 5 there is no built-in grid view. You have to use a UITableView and layout the cell on each row yourself. I was shocked when I heard that. Guess I’m spoiled by Android? We have that since version 1! Fortunately UICollectionView was introduced in iOS 6, and unlike Android, it is okay to target the latest OS release because most users upgrade very quickly. Until recently the device form factor was pretty uniform. There is Retina and Non-Retina, that’s it. Different density, same aspect ratio. Same aspect ratio means you can still use a coordinate-based layout system and align your views in Interface Builder. This is the moment when I doubt if it was wise to go with storyboard. It seems to be designed for very simple navigation needs, and even my 4-screen app is too complicated for it. I ended up popping one level higher with a flag to automatically forward me to view the collage. Bit of a hack, but I was too far deep into storyboard to back out and recreate all the views in xib. Especially since I have no way of copying and pasting the layouts, so I have to drag and drop everything again. 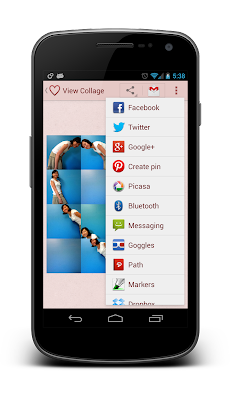 After you make a Heart Collage, the app lets you share it with your friends. This is super easy on Android. I just create an Intent saying that I want to share an image, and the system automatically generates the list of installed apps that can handle that. It’s an elegant way to have a personalized and extensible experience. Users can share their collages with any apps they prefer, and I don’t even need to know they use that app, let alone creating a new integration point. The flip side though, I know exactly who can run my app, and I don’t need to worry about leaks. For Android, once you send out an apk you have no idea where it will go. And there isn’t really a good way to limit the distribution. And now, the final moment - release to store. No anxiety for Android at all. Just upload, wait for an hour or so, and it’s live. For iOS, there is the review process. I want to release Heart Collage before Valentine’s Day, so I submitted at the end of January. There should be plenty of time, but the potential rejection was stressing me out. I was so relieved when the app got approved the first try, in 6 days. Jubilation! I have been mostly pointing out the difference between iOS and Android. But at the end of the day, they are more similar than different. In terms of technology, at least. The verdict is still out on the money. Is it true that iOS users are more willing to pay for apps? Which platform will generate more revenue? That will be the driving force for my decision to spend time on iOS vs Android, and the numbers are still out. Will Heart Collage get more downloads on iOS or Android? We shall see. Many thanks to Cyril Mottier and Tim Burks for reviewing the draft of this article. Super excited that I just launched my app Heart Collage, just in time for Valentine's Day! The app shows you how to pose for each part, snaps the shots one by one, and stitch them all together into a Heart Collage. I love watching people pose for the various parts of the heart - it's hilarious! Get the app from Google Play or Apple App Store, and let me know what you think!